Today’s post was written by Darren Clay, assistant principal and MIE at Bear Creek Middle School in Fairburn, Georgia. A Microsoft Showcase School connection call with Mark Sparvell last November forever changed the landscape of Bear Creek Middle School (grades 6-8). It was during that call that the Bear Creek leadership team became inspired to use Microsoft tools to change the path and pace by which students learn. 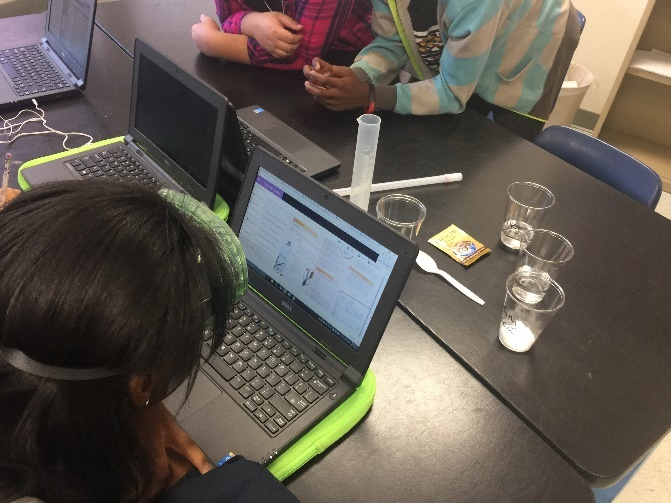 In conjunction with the district’s personalized learning initiative, Bear Creek recently began a paperless school model through the use of the OneNote Class Notebooks. Bear Creek—located just south of Atlanta, Georgia, in the Fulton County School District—implemented a 1:1 device initiative, which provides over 1,100 students with a Windows 10 Dell laptop. As an Office 365 school, the transition to OneNote Class Notebooks has been seamless. To ensure effective implementation of their paperless school model, Bear Creek has taken a grassroots approach to transform instructional practices. The implementation of OneNote started with the school leadership team. Anthony Newbold and Darren Clay, the school principal and assistant principal, have recently been named Microsoft Innovative Educator Experts, making them a rare combination of school-based leaders. After finalizing school budgets this past summer, Anthony and Darren met with Kali Aflord, an instructional technology specialist from the Kennesaw State University (KSU) iTeach group. They collaborated to strategize on ways to maximize on technological resources. The conversation between the three revealed an excessive amount of money and instructional time being dedicated on using and distributing paper. They estimated that passing out 30 sheets of paper takes about 90 seconds. Over the course of a 190-day school year that equates to 4.75 hours of lost instructional time in one class. 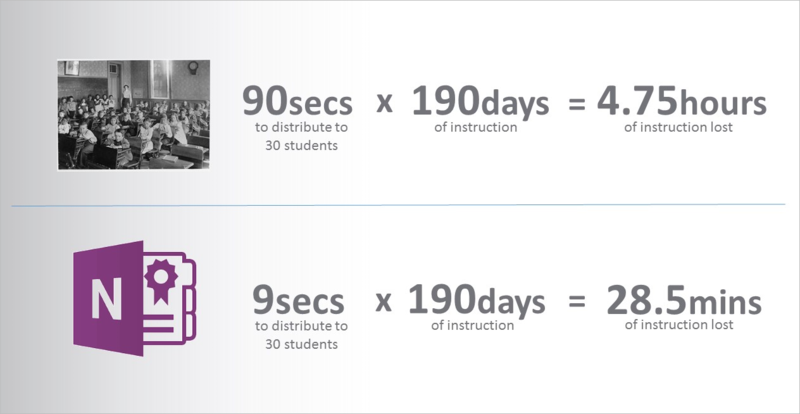 By leveraging the OneNote Class Notebook, that 90 seconds of passing out paper diminishes to just 9 seconds and only 28.5 minutes of lost instructional time over the course of the school year. Reviewing the previous year’s budget indicated an excess of $30,000 allocated for purchasing paper and maintaining three copy machines. These findings led Bear Creek to a goal of going paperless by the end of the school year. 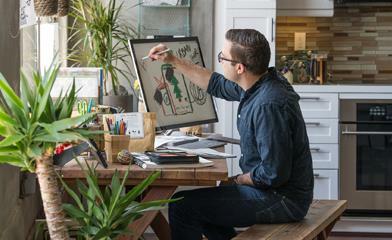 Anthony, Kali and Darren knew that transitioning to OneNote would break away from traditional classroom practices that for decades had been reliant on heavy paper use. However, for this initiative to be a success there would need to be strong and innovative support mechanisms put in place. While designing professional development for such a robust platform, Bear Creek partnered with Kali and Alexandra Larson, another instructional technology specialist from the KSU iTeach group. Keeping the overall goal in the mind, the team developed a tiered and differentiated approach to professional development that focuses on teacher showcases and performance-based assessments. The days of “sit and get” whole group professional development are no more at Bear Creek Middle School. Enter job embedded professional development! Kali and Alexandra came into classrooms and worked one-on-one with teachers to create transformative lessons using OneNote. 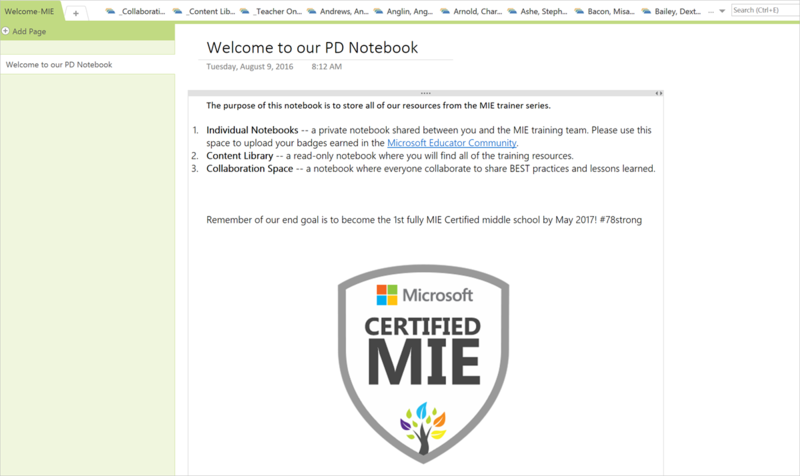 The OneNote Class Notebook is a major component of the school’s broader goal to become a fully Microsoft Innovative Educator (MIE) certified school. By the end of the year, all instructional staff members will have earned their MIE certification. The Bear Creek instructional technology department has designed a series of MIE trainings that highlight a variety of Microsoft products. With OneNote serving as the primary platform for teaching and learning, the team focused on OneNote Class Notebook and leveraged the pilot cohort during the delivery of this training series. Teachers are required to submit “MIE artifacts” to show evidence of their use of a variety of tools in the classroom. During the sessions, teachers are grouped based on their performance and competence with each tool. The beauty of the professional development framework lies in the ability of teachers to move at their own pace while receiving additional layers of support from teacher-leaders who have demonstrated mastery. After only the third month of this technology-enriched coaching model, teachers have transformed instruction in blended and virtual spaces. Science lab experiments in OneNote. To begin the paperless school model, the school instructional technology department decided to begin with a pilot cohort of three teachers. The teacher trio was tasked with going completely paperless beginning on the first day of school. They worked intensely with the KSU coaches to develop Content Libraries and Collaboration Spaces within their OneNote Class Notebooks. During the initial stages, the teachers worked through learning curves and willingly shared best practices with their peers. As the pilot cohort began to share their OneNote journey with peers, the benefits of its use began to “catch fire,” which has sparked innovation in classrooms throughout the school. The Bear Creek teachers are most delighted about the ability to embed content from other tools such as Microsoft Forms, Sway and YouTube directly into their OneNote pages. Now, teachers feel they can safely manage their virtual learning environments because students don’t necessarily have to leave their OneNote page to access secondary tools. We have seen a tremendous increase in the use of Microsoft Forms for formative assessments in the student notebooks. 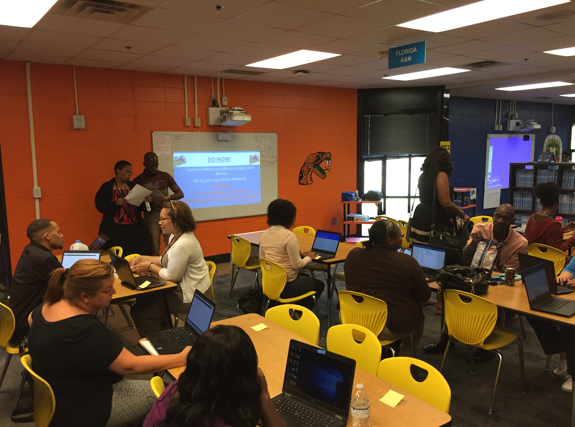 In addition, teachers were introduced to the Office 365 PLC group that comes with a OneNote Notebook. 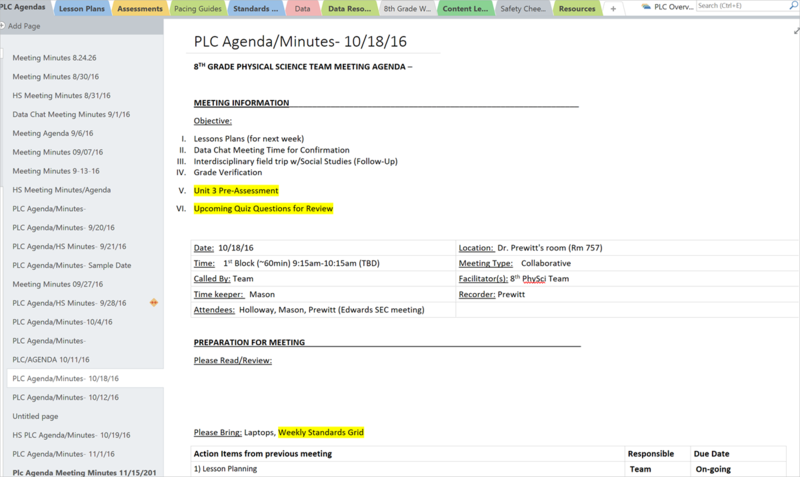 Each grade level content team uses the PLC notebook to develop common lesson plans, assessments, meeting agendas/minutes and analyze student data. “This has saved the teachers time while keeping information organized and readily available. Our teachers no longer have to sift through emails to find a lesson plan. They simply access their PLC notebook,” said Anthony Newbold, Bear Creek principal. The Bear Creek leadership also take it upon themselves to lead by example by using OneNote for the faculty handbook, lesson observations, task management and team collaboration. Bear Creek plans to continue to build-in and share their story during their second annual Redefining Learning Conference (RLC). The conference will offer a series of concurrent sessions on OneNote Class Notebooks as well as other Microsoft tools. 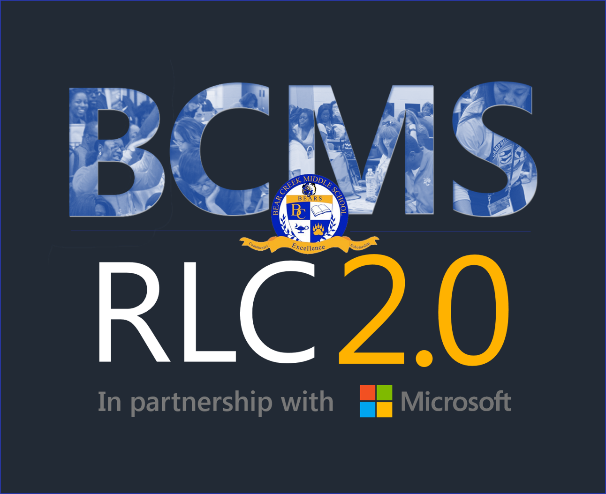 The inaugural Bear Creek RLC hosted over 1,200 attendees and featured over 130 presenters, making it the largest school-led RLC in U.S. history. The conference is shaping up to be even bigger than last year! Bear Creek is in high spirits about the educational technology movement and is honored to showcase a conference that will expose other educators to the power of OneNote. As Bear Creek continues to evolve, the school will continue to navigate on a path that will constantly innovate the teaching and learning process.